Yet Another Caret Workshop · Gokhan Ciflikli, Ph.D. Yesterday I gave a workshop on applied predictive modelling1 with caret at the 1st LSE Computational Social Science hackathon. Organiser privileges. I put together some introductory code and started a simple GitHub repo for the participants, so I thought I’d share it here as well. This is not supposed to cover all aspects of caret (plus there is already this), but more of a starter-pack for those who might be migrating from Python or another machine learning library like mlr. I have also saved the environment as caret.rdata, so that the participants can load it up during the workshop (insert harrowing experience about live coding) and follow through—that’s included in the repo too if you rather have a test run first. ##   "TwoFactor1" "TwoFactor2" "Linear1"    "Linear2"    "Nonlinear1"
##   "Nonlinear2" "Nonlinear3" "Noise1"     "Noise2"     "Noise3"
##  "Noise4"     "Noise5"     "Corr1"      "Corr2"      "Class"
You should also try out xray::anomalies(dat) and see which output you prefer. Because our data is synthetic, we have these nice bell curves and normal distributions that are harder to locate in the wild. First, we supply the outcome variable y so that caret can take it into account when creating the split (in terms of class-balance). We use 70% of the data for training and hold out the remaining 30% for testing later. 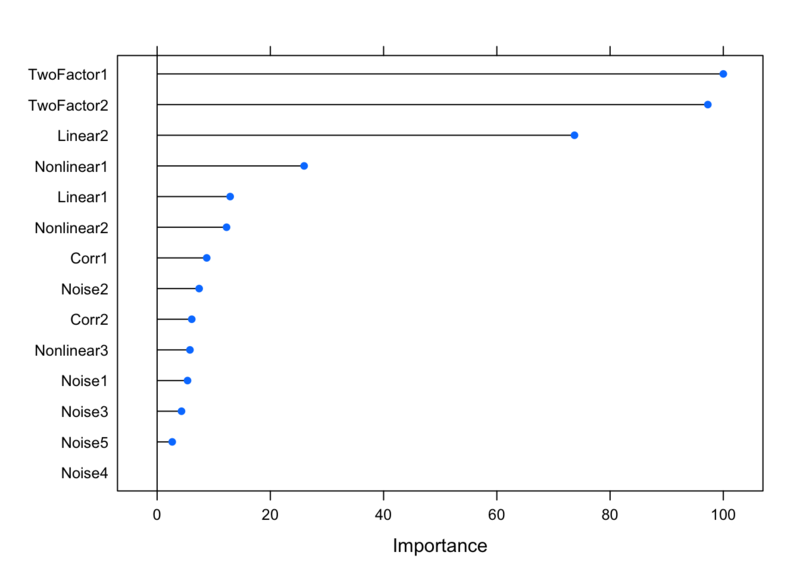 We want a vector instead of a list so we convey this to R by overriding the default behaviour. The actual splitting happens when we subset using the index we just created; the selected row numbers generate the training data whereas the rest goes to the test (using negative indexing). cls.ctrl <- trainControl(method = "repeatedcv", #boot, cv, LOOCV, timeslice OR adaptive etc. There is a good variety of cross-validation methods you can choose in caret, which I will not cover here. classProbs computes class probabilities for each resample. We need to set the summary function to twoClassSummary for binary classification. Finally, we set save predictions to TRUE—note that this is not a classification-specific argument; we didn’t have it in the regression controls because we won’t be covering them here in detail. For future reference, there are several other useful arguments that you can call within trainControl. For example, you can evoke subsampling using sampling if you have class-imbalance. You can set seeds for each resample for perfect reproducibility. You can also define your own indices (index) for resampling purposes. Probably not the most amazing \(R^2\) value you have ever seen, but that’s alright. Note that calling the model fit displays the most crucial information in a succinct way. Let’s fit a couple of other models before moving on. One common choice would be the elastic net. Elastic net relies on L1 and L2 regularisations and it’s basically a mix of both: the former shrinks some variable coefficients to zero (so that they are dropped out; i.e. 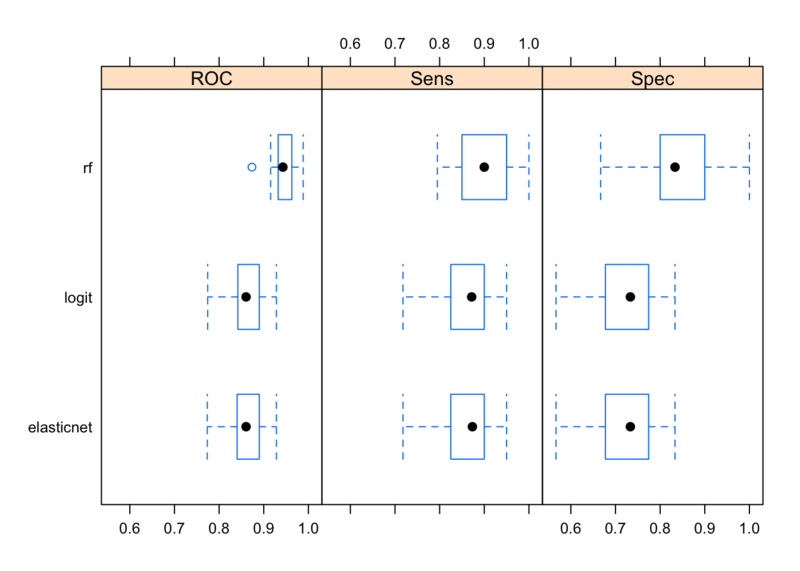 feature selection/dimensionality reduction), whereas the latter penalises coefficient size. 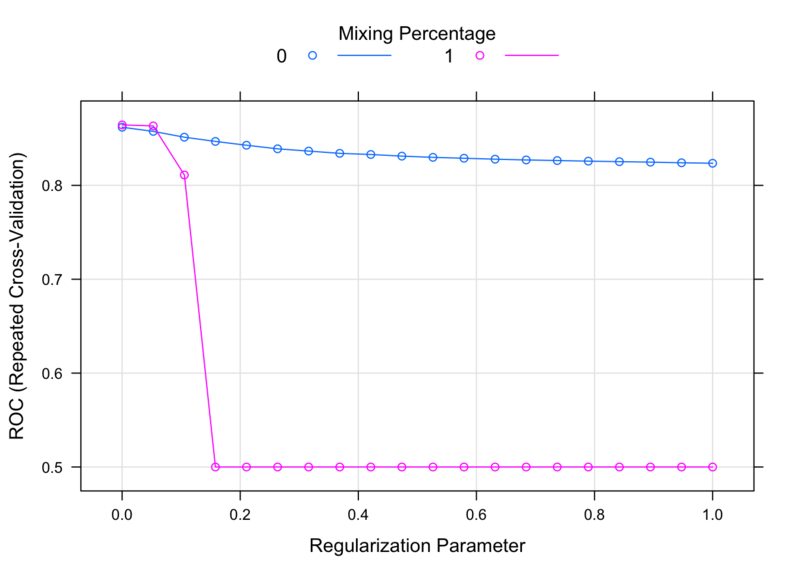 In R, it has two hyper-parameters that can be tuned: alpha and lambda. Alpha controls the type of regression; 0 representing Ridge and 1 denoting LASSO (Least Absolute Shrinkage and Selector Operator)2. Lambda, on the other hand, determines the penalty amount. Note that the expand.grid function actually just creates a dataset with two columns called alpha and lambda, which are then used for the model fit based on the value-pairs in each row. where the two colours denote the alpha level and the dots are the specified lambda values. Averaged over all resamples, the Random Forest algorithm has the highest ROC value, however the whiskers overlap in all three categories—perhaps a larger number of resamples are needed for significant separation. It also outperforms other two algorithms when it comes to detecting true positives and true negatives. Note that often the results will not be this clear; it’s common for an algorithm to do really well in one area and perform terribly in the other. 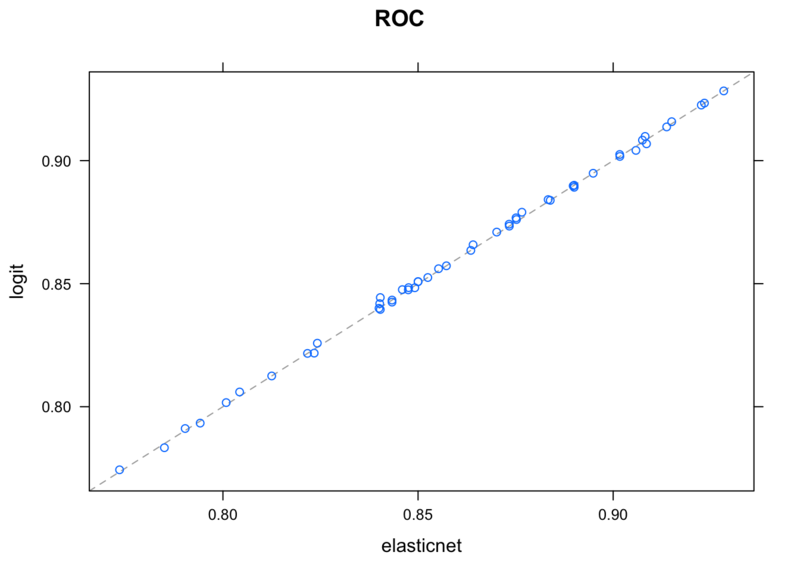 The ROC of the ensemble (0.9517) is higher than any individual model, however the Random Forest algorithm by itself provides similar levels of accuracy (0.9469). As an extra, I’ll briefly cover several feature selection wrapper functions that are available in caret. RFE works by passing a vector of subsets consisting of different number of variables to be used in model fitting. For example, because we only have 14 variables in our dataset (excluding the outcome), we can try all numbers from one to 14. With all three feature selection algorithms, we will need to change the summary function to twoClassSummary for classification purposes. We see that the model with four variables (indicated with an asterisk) resulted in the highest ROC value and thus selected as the best model. The top variables are also displayed at the end. One approach would be fitting a model on the test data using these four variables only. Last but not least, we will cover genetic algorithms. Here, variables are put through pressures similar to that of natural selection. We keep the iteration and population sizes really, really low as the code chunks are only supposed to give you a working example of the process. These algorithms fit a lot of models, so always start with a small value and gradually increase the number of iterations/generations. Given the small number of iterations used for SA and GA, we can’t really judge the quality of their results. However, running the algorithms for hundreds or thousands of iterations is not necessarily the best option either. As these algorithms focus on maximising in-sample ROC, given enough iterations, they will perfectly learn the specific noise of your dataset and will not generalise to unseen data (i.e. over-fitting). As always, aim to leverage your domain knowledge and gradually increase the number of iterations until you see a divergence between training and test validation results.